Are you sick of hearing this in the postseason?—The better team didn’t win the game last night. It happens all the time throughout the year but generally goes unmentioned, because the regular-season sample size is large enough that those things are generally supposed to work themselves out over time. 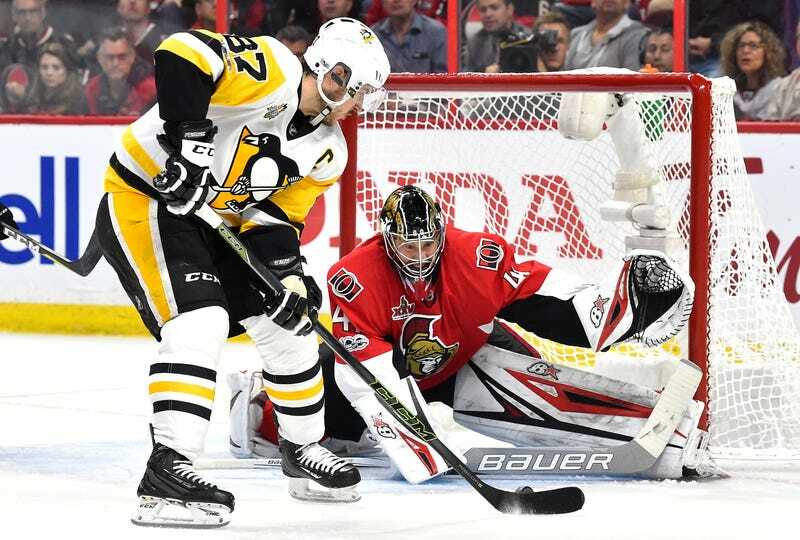 But in the playoffs these anomalies stand out, because in a best-of-seven series—or even more acutely, in Thursday’s Game 7 in Pittsburgh—there’s little to no time for regression to the mean. Every single time, the Senators will take a game like Tuesday’s, getting outplayed and getting the win. Anderson was a beast in making 45 saves, including 22 in the second period alone. He made a number of especially sharp stops on Sidney Crosby (who is pretty much looking like his old self again, by the way). Anderson probably hasn’t gotten enough credit in this playoff run, with most of the focus on Guy Boucher’s effective defensive system. But if Anderson is the biggest reason there’ll be a Game 7, he’s also the only reason Boucher is here in the first place. Anderson certainly gives the Sens a chance, and more than that, he drives a style of play. As Boucher noted, everything “starts with the goalie.” Forward Zack Smith said knowing Anderson is back there has knock-on effects all the way up the ice. All context and records will be shed for Game 7, the players bringing only the baggage they choose. Just 60 minutes—or more!—with the East on the line. If someone’s going to step up and do an outsized part to win a game and the series and the conference, it’s more than likely going to be a goaltender. And if it is, the Senators have to like their chances.